While the development of pharmacological therapies for some patients suffering from the chronic, systemic, inflammatory disorder rheumatoid arthritis (RA) has provided enabled better clinical outcomes, the associated costs and side-effects have prompted the search for new, safe, and more effective treatment options. Researchers from the group of Kichul Shin (SMG‐SNU Boramae Medical Center, Dongjak‐gu, Seoul, South Korea) knew that mesenchymal stem cells (MSCs) represented a potentially exciting therapy for RA [1, 2] and previously reported  on the mechanisms involved in the amelioration of inflammatory arthritis by infusions of human umbilical cord blood‐derived MSCs (hUCB‐MSCs) [4, 5]. In STEM CELLS Translational Medicine, Park et al. now report on the first human trial of hUCB‐MSC infusion in RA patients, with results suggesting the safety, tolerability, and potential efficacy of a single intravenous infusion . Furthermore, the trial observed reduced levels of pro-inflammatory cytokines at 24 hours in the patients receiving the highest cell dose. Overall, this new trial reports safety and tolerability and suggests the efficacy of a single intravenous infusion of hUCB‐MSCs in patients with RA. The authors note that they are currently conducting 5‐year observational studies in these patients and hope to expand this potentially exciting therapeutic option to larger trials. For more on the potential of human umbilical cord blood‐MSC in treating RA and related disorders, stay tuned to the Stem Cells Portal. Shin T-H, Kim H-S, Kang T-W, et al., Human umbilical cord blood-stem cells direct macrophage polarization and block inflammasome activation to alleviate rheumatoid arthritis. Cell death & disease 2016;7:e2524. Alvaro-Gracia JM, Jover JA, Garcia-Vicuna R, et al., Intravenous administration of expanded allogeneic adipose-derived mesenchymal stem cells in refractory rheumatoid arthritis (Cx611): results of a multicentre, dose escalation, randomised, single-blind, placebo-controlled phase Ib/IIa clinical trial. Ann Rheum Dis 2017;76:196-202. Shin T-H, Kim H-S, Kang T-W, et al., Human umbilical cord blood-stem cells direct macrophage polarization and block inflammasome activation to alleviate rheumatoid arthritis. Cell Death &Amp; Disease 2016;7:e2524. Lu LL, Liu YJ, Yang SG, et al., Isolation and characterization of human umbilical cord mesenchymal stem cells with hematopoiesis-supportive function and other potentials. Haematologica 2006;91:1017-26. Baksh D, Yao R, and Tuan RS, Comparison of proliferative and multilineage differentiation potential of human mesenchymal stem cells derived from umbilical cord and bone marrow. Stem Cells 2007;25:1384-92. 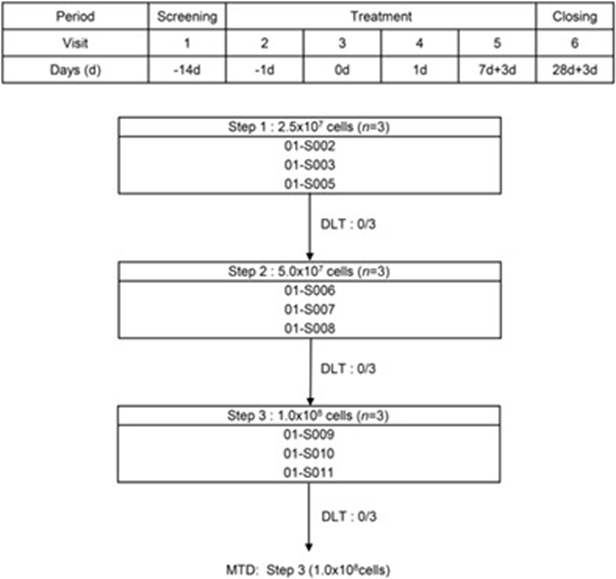 Park EH, Lim H-s, Lee S, et al., Intravenous Infusion of Umbilical Cord Blood-Derived Mesenchymal Stem Cells in Rheumatoid Arthritis: A Phase Ia Clinical Trial. STEM CELLS Translational Medicine 2018;7:636-642.